Uniqueness is very important to make life happier. Today several tools are available to modify the things and provide you with the decent and unique mode. Some changes will be done by these tools to make things more attractive to users. These apps organize and change the looks without any deformation in originality. The best practices used by these tools. You know that technology is upgrading very fast in the present scenario. Speed is out of our expectation. You will not imagine that things may be changes in this way. Every minute of the human being is based on the support of technology and This technical improvement has changed the world activity. Every day of your life depends on technical support. You can not leave to upgrade yourself and avoid dependency on technology. You will learn and have knowledge about that. The best way to upgrade yourself with enjoyment. An optimistic think to push to learn about the technology. The best Apps selected for you. These can be used to provide the uniqueness in reading the magazine, decent changes in photo, songs, and writing. 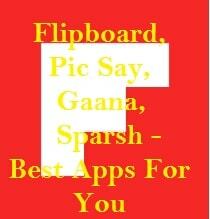 Flipboard - This is very helpful to change the look of your mobile or tablet Magazine. You have to choose the magazine and newspaper in this app. The platform user interface converts the look of chosen magazine and newspaper as a book. Of course, that will be completely converted and serve in front of you to read the book like turning over the pages of hard copy. You can read it like the book. This app also provides the button to add social media platform to share the content. Use this app, definitely, you will fill happiness. Pic Say- If you are not filling well to capture the photo from your mobile. Just use this app to modify your picture and will make unique. This app will correct the color, red eye, and brightness. App provides a special effect with the help of Word Balloon, Paint Brush, Title, Hats & Helmets, Hair, Halloween etc. The picture can be mold to establish the word in that by inbuilt features. Other tools create a decent look to make the picture of laughter. Gaana - This is a very good app for the music listener. This app is an audio streaming app. It is very easy to use. Your 3G internet connection is enough to run this audio. You will get the collection of national and international songs. The search option is also there to find the songs as per choice. The very good feature is to make your own playlist with the help of search option. The platform also provides the social media tools to share the songs with nearest and dearest. Sparsh - This tools will help to convert your English typing in Hindi. The other language is also available like Kannar, Tamil. Every keyword is available on the keyboard. The best way to convert language on the mobile phone. So, many people face writing the message in Hindi on Smartphone. The best tools for them. These apps are very useful for entertainment and zeal.